Delicious delicate, crisp and fresh salmon cakes are easy to make. These old bay seasoned salmon cakes with bite-sized chunks of salmon are small but bursting with flavor. 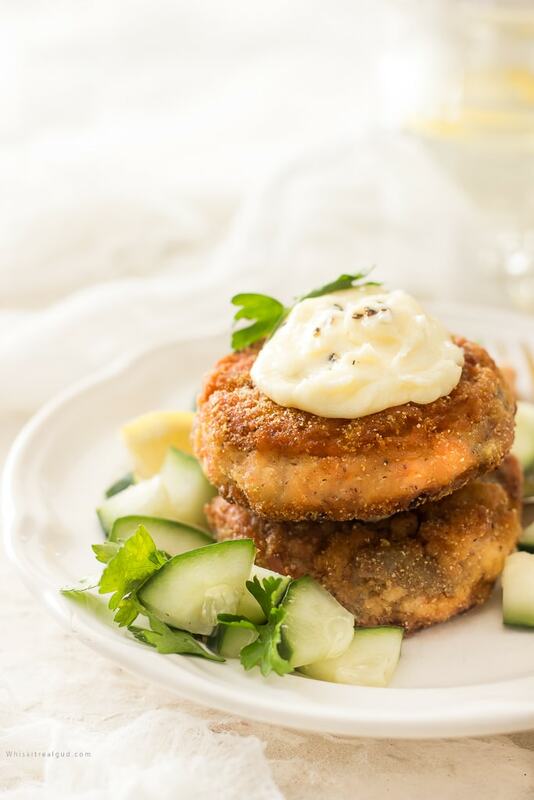 Salmon cakes made with fresh salmon are perfect for lunch, dinner, as an appetizer or a snack. Fresh salmon cakes are so good, plus they taste so much better than canned salmon cakes. I grew up eating canned salmon cakes but I couldn’t bring myself to like it. I just ate it because I didn’t want to end up hungry plus I didn’t want my mom to get on me about not eating my dinner. Fresh salmon is just that. It’s fresh with a more distinct salmon flavor. The first time I tried fresh salmon cakes, I fell in love with it. My friend and I was out eating at a restaurant. She told me that she was going to order salmon and a salad. I frowned my face at her. She said that the salmon at that particular restaurant was extremely delicious. I told her that I DO NOT like salmon. My friend was pretty positive that I would like the salmon. She said that the salmon was not canned but fresh and filled with peppers and celery, onions, capers, etc. I still wasn’t convinced so I ordered pasta. Our food came out and everything looked amazing. She insisted that I try the salmon out. I gave in and tried a tiny piece. I was pleasantly surprised that the salmon cake was actually very good. She let me taste a bit more. Long story short, I ended up buying a salmon cake to go. From that day on I have been in love with salmon cakes. I’ve also been searching for a recipe that tasted similar to the one I tried at the restaurant and this Ina Garten’s recipe is pretty close. 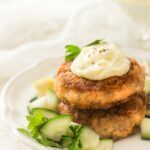 Salmon cakes are so easy to make and they are delicious with a sauce and a simple salad, rice potatoes, asparagus. I’m getting hungry just thinking about salmon cakes. Below is a quick rundown on how I make them. First, I bake the salmon until just cooked through. Let it cool then refrigerate it for 30 minutes. Cook the vegetables with the seasonings. I mix the fresh flaked salmon with the cooked veggies mixture, mayo and eggs. Shape into 10 (2 1/2 to 3-ounce) cakes. You can also use a 1/4 and scoop the mixture instead of measuring it. I coat the fresh salmon patties in flour then I fry them and serve with either mayo and lemon juice, thai chili sauce, or Thai chili mayo. You’re going to want a sauce for these fresh salmon patties so I posted a couple of quick recipes for you below in the recipe below. I love frying salmon cakes. They fry up delicate but nice and crisp with tiny piece of FRESH salmon, a good dose of sweet bell peppers, onions and celery. So tasty! The vegetable amount in the recipe may seem like a lot but it’s not. 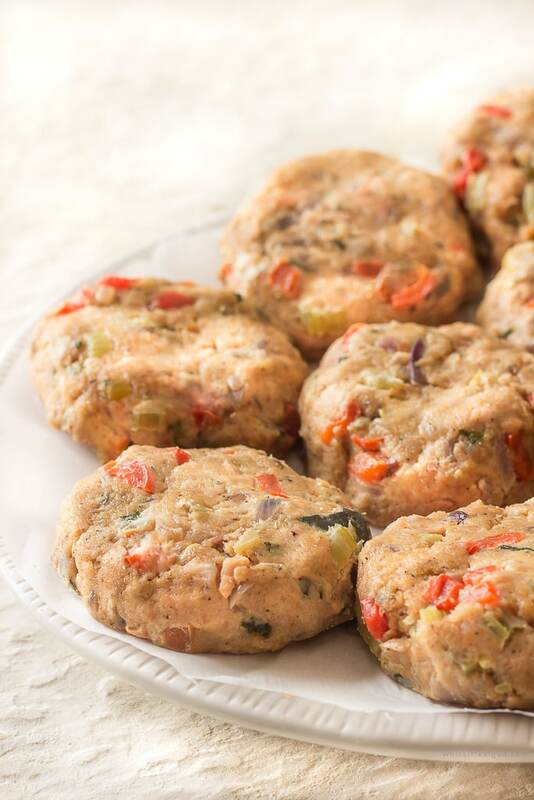 The sweet bell peppers, onion and celery really boosts the flavor in the fresh salmon cakes. I love to serve salmon cakes simply with fresh lemon juice with mayonnaise. I also love it with Thai chili sauce. or with remoulade sauce. Salmon patties and Thai chili sauce go SO well together. I think that’s my favorite way to serve them. Give it a try and see for yourself. Delicious delicate, crisp and fresh salmon patties/cakes are easy to make and perfect for lunch, dinner or a snack. These patties with bite-sized chunks of salmon are small but bursting with flavor. Preheat oven to 350 degrees Fahrenheit. Place salmon on a sheet pan skin side down. Brush with olive oil. Sprinkle with salt and pepper. Bake the salmon for 15-20 minutes until just cooked through Remove from the oven cover with foil. Let the salmon rest for 10 minutes then chill in the refrigerator until cold. Meanwhile, place 2 tablespoons of the butter, 2 tablespoons olive oil and all the vegetables, parsley, the seasoning, hot sauce, Worcestershire, 1/2 teaspoon salt, and 1/2 teaspoon pepper sauce in a large saute pan over medium low heat until the vegetables are soft, approximately 15 to 20 minutes. Cool to room temperature. Place the bread crumbs on a sheet pan and toast in the oven for 5 minutes until lightly browned, tossing occasionally. Flake the chilled salmon into a large bowl. Add the bread crumbs, mustard and and mayonnaise and eggs. Add the vegetable mixture and mix well. Cover with foil or saran wrap and chill in the refrigerator for 30 minutes. Shape into 10 (2 1/2 to 3-ounce) cakes. Sprinkle both sides of the salmon patties with cornmeal. (optional) This step is not in Ina's recipe but I like to add it. Heat remaining 2 tablespoons of butter and two tablespoons of olive oil in a large saute pan over medium heat. Cook patties for 3-4 minutes on each side or until cooked through and browned. Drain salmon cakes on paper towels. Serve hot with your choice of sauce. See notes for sauce recipes/recommendations. Add all ingredients to a bow and mix well. FYI: Recipe inactive time is 30 minutes. Freezer instructions: Shape into patties but do not cook them. Place patties on a baking sheet until they firm up some. Using wrapping paper wrap each patty in the plastic wrap then place them in a freezer Ziploc bag. Store for up to one month. Defrost overnight in the refrigerator. Cook the salmon per the recipe instructions. This looks so good. SOOO good! I’m such a fan of salamon and I’m always looking for new recipes and new ways to prepare it. This is something that my whole family will like. I’m definitely making this. Fabulous! These were fantastic! My family really enjoyed these! Great recipe! These looks incredible! I love the combo of the capers and hot sauce. 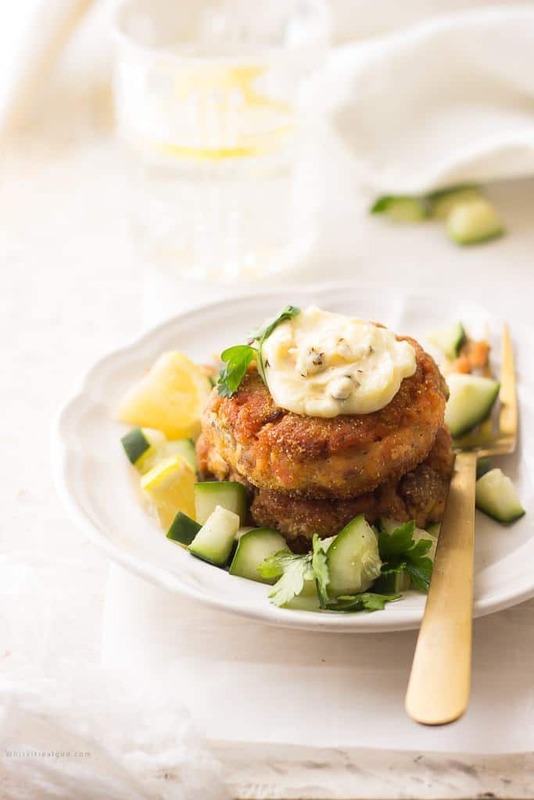 Salmon cakes packed with flavor- just the way I like them! These sound incredible! I’d love to make them ahead and have them for weeknight dinners or even work lunches. Great recipe! This recipe caught my attention as soon as I read the title. I love Ina Garten and love to make her recipes. I have yet to try this salmon cake recipe, but I most certainly will. I’m so glad to find a recipe that does not use salmon from a can! I will often use canned salmon for quick meals, but I prefer to use fresh. Thank you! Yum! I grew up eating salmon cakes but never with that Thai chili sauce. I’ll have to try that next time! My mom always made salmon caked and this recipe reminds me of them! I love the addition of all the fresh veggies and herbs in this recipe! I can’t wait to try it! I love salmon and would love to try those cakes too! It is the perfect kind of meal for me, especially for the weekend! I love them any day of the week! Thank you Llana! I love easy salmon recipes like this! Especially now with spring around the corner, this dish sounds especially inviting to me! Your presentation is spot-on, as always! These look absolutely incredible! Fantastic work with them – can’t wait to try these for myself at home. Yum! Thank you so much Mairi! I hope you enjoy them! Pinned for later because I must make these salmon cakes. Thank you Jere. I really hope you can make them soon! OMG! I need to try these ASAP. My mom used to make salmon patties for me often when I was growing up. These look like a grown up version. Def put this recipe on your to do list! Thank you Jordan! April, these look amazing! And that remoulade sauce is gorgeous! Oh wow, now these look sophisticated! These would be fantastic for a brunch! I’m planning a family brunch in honor of my mom for Mother’s Day. Pinning this recipe for then! I never thought of having these for brunch but now that you mentioned it, I may have to add this to my brunch menu! Thank you!